Hi everyone, I know it's a long time since my last post but I had to have a little operation after my holiday and the surgery left me with a very swollen eye so sitting at the PC hasn't really been an option. Anyway it's improving a little now so I have managed a few new designs this week. 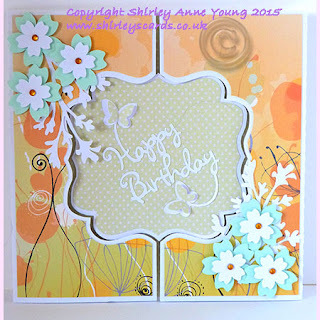 First of all this is the freebie Butterfly card - plenty of space to add your own sentiments/embellishments. The download links are at the end of this post. If you like it please let me know by leaving a comment. This is my first Christmas design of the year - I intend to add some glitter to the snow to bling it up a bit - the backing paper is included with the file. A box easel card - the drawer is somewhere to hide a little surprise gift for the recipient - files for the box also included. Finally a gatefold card with a bracket shaped aperture. Merci beaucoup Shirley pour ce joli fichier carte papillon. Your cards are beautiful. Thank you for sharing. Have a great day. I am so glad you are recovering and feeling better! thank you for the beautiful butterfly card, I'm sure it will make a great feel better card and brighten the day of someone on my list! Such lovely designs Shirley, the butterfly is lovely. Oh! my goodness you have made up for lost time and with fabulous designs too. Thank you. Hope you are feeling better after your operation and the swelling is well and truly down. I can't thank you enough for sharing your talents with us. Good to hear you are feeling better after your operation. Look after yourself and rest up when you need. Take care and thank you for sharing your amazing talent with us. You make so many people happy. Glad to hear you are on the mend! Beautiful butterfly card -- thanks for sharing. Thank you for sharing this file and I'm glad you are finally on the mend and feeling better! Thanks so much for sharing this lovely file. Just want to thank you for all the great files. I make cards for the local veterans hospital and several nursing homes. The free files are a great addition to my stash and will be well used for that purpose. I am headed to the website to see what I can use. Will send photos when done. Currently;y trying to complete 300 Christmas cards. merci beaucoup pour ces belles cartes!! Thank you for this freebie! I've been wanting a butterfly card!